​My meagre reading consists of stray books, normally non-fiction. My mother tongue Gujarati would be my preference, but I also like to read books and magazines in English and sometimes Hindi. 4. How does it feel when your story gets published online? 5. You have translated / reviewed a handful of stories for us. Which one has been your favourite and why? 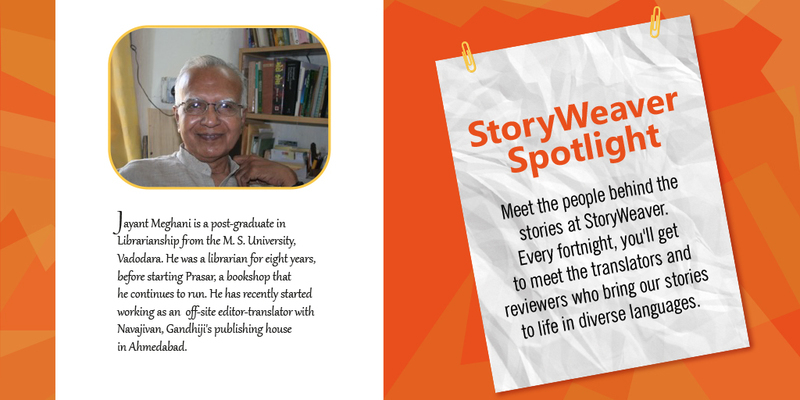 ​I really enjoyed working with quite a few stories. One that I had particularly liked was about a cat in the Sahyadris - ‘Cat in the Ghat’. 6. What is your key driver in taking this up? ​Being a bookman all my working life​ - now over half a century - I love to work with words, in my own language as also in English. The kind of stuff that you create is purposeful and that attracts me even when I am hard pressed for time. 7. How has your overall experience with StoryWeaver been? ​બાલસાહિત્યના અનુવાદ અને સંપાદનનો મારો અનુભવ ખૂબ આનંદદાયક અને ઉત્સાહપ્રેરક રહ્યો. મને લાગ્યું કે જેમને જાણતો​ નથી એ તમે બધાં મિત્રો સમાન રસનાં છો, અને તમારી સાથે કામ કરવાનું મારા વ્યસ્ત નિવૃત્તિકાળમાં ઊંડો સંતોષ અને આનંદ આપનાર છે. 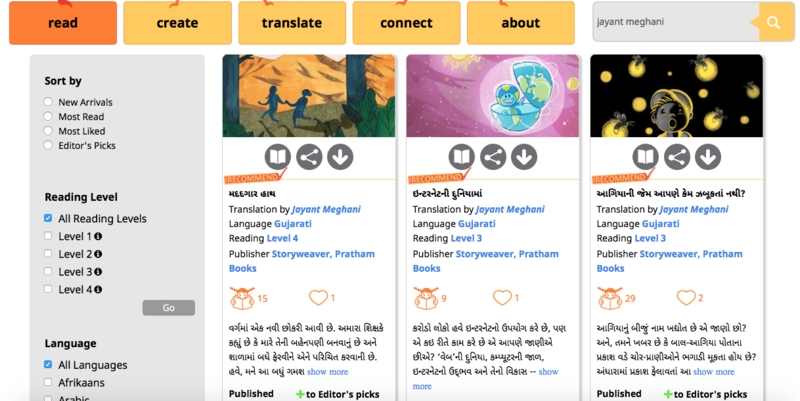 The experience of translation and editing with Pratham Books StoryWeaver has been delightful and stimulating. It is satisfying and joy-giving to work with you in this active dusk of life. 8. While reviewing stories, what are the top three things you keep in mind? ​Any material for wider consumption amongst children should be clean and correct ​in the matter of language, and aesthetically healthy and of good taste. Ultimately everything should boil down to creating a better human being. Stories should be entertaining no doubt, but the element of education is of paramount importance in our developing society.